What do Leonardo, Donatello, Raphael, and Michelangelo have in common with our supply of corn, soybeans, and canola (all major parts of the North American diet)? They’ve all been covered with glowing ooze and genetically modified. Much like the Teenage Mutant Ninja Turtles were transformed into man-child humanoids by mysterious ooze, our food supply has been genetically modified by the “mysteries” of science. Thanks to a helpful link from my brother, I’ve recently learned that genetically modified foods (GMOs) make up about 80% of the processed items sitting on grocery store shelves. That means that science has manipulated the DNA of the main ingredient to make it. . .different, so that it can handle drought, grow faster, etc. There’s even talk of an FDA-approved, genetically modified salmon. Mmmmm. . .it’s bigger and meatier and more mutant-like than regular salmon! In 2011, a University of Sherbrooke Hospital (Quebec) study found traces of an insecticide in the blood of 93% of 30 pregnant women (and in the umbilical cord blood of 80%). The study indicated genetically modified corn as the culprit. Funny thing is, there’s been no real testing on how GMOs affect the human body. No testing means no evidence. No evidence means no labeling, which is kind of convenient for those that want us to buy GMO items. Have you ever seen a label on something with high fructose corn syrup (a GMO ingredient) that says “Genetically Modified”? I haven’t either, but I’d sure like to be able to choose between one that is a GMO and one that is not. (Visit JustLabelIt.org for more info.) I’d say GMOs are another reason to buy local and know the source of the food you consume. 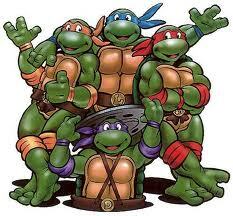 Eating Teenage Mutant Ninja Food is about as appealing as living in a sewer with a sensei rat named Splinter. That’s why I’m on my way to visit John from my favorite produce stand. He’s going to show me around his garden, and I’m hoping to help him plant some asparagus. I’ll let you know if I see any glowing ooze in John’s garden. Last time I was visiting the USA, I had a weird experience after eating sweets (snakes, jelly beans etc). Within an hour I had a raging headache and I felt plain weird. This had never happened back in Australia (where there is a lot less high fructose corn syrup in sweets). I will never voluntarily eat the stuff again. If Australia follows the USA (as it inevitably does), However even in the USA, the solution is simple – don’t buy processed foods! As you advocate Rachel, buy local fresh food and make it yourself. Eat simply, eat better and eat local. Hi Paola! There is nothing worse that eating something and getting that headache. I’ve had it before too. That’s exactly why we need to “eat simply,” which is a good motto to follow! Thanks for commenting. Thanks for drawing attention to this important topic! It’s hard not to get on a soap box every now and then, especially when it comes to making good food choices!